WBO Oriental bantamweight champion Michael Domingo who faces devastating puncher Luis Melendez of Colombia who effectively ended the career of the classy Z “The Dream” Gorres last November, came in at 119 pounds during the official weigh-in at the Ayala Activity Center here in Cebu but Domingo and his handlers ley it go because it’s a non-title ten round bout. Melendez who arrived in Cebu from Colombia after a long and tiring journey where he was shunted from one country to another with only the clothes on his back because their luggage was left behind in Caracas, Venezuela had to reduce a couple of excess pounds overnight which he did with no trouble. 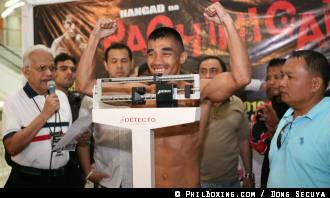 Domingo was on the button at 118 and expressed confidence he would defeat the rugged Colombian and prove his worth. There was a buzz when the menacing-looking Kenyan James Kimori came in some three-and-a-half pounds above the stipulated weight of 136 pounds, with a one pound allowance. Forced to reduce two pounds Kimori went to a sauna at the Activity Center gym and returned one hour later only to find out that he was still one pound over the weight limit where his opponent, Jimrex Jaca weighed in at 136 ½ pounds. Kimori then went around the complex in the stifling heat and returned to tip the scales within the stipulated 137 pound limit. Although his having to reduce weight is likely to tell on him when he takes on the hard-hitting southpaw Jaca, Kimori who is himself a southpaw said he is sticking to his original plan of exploding after five rounds and hopefully knocking Jaca out. Jaca said he doubted whether Kimori who struggled to make the weight would even last five rounds. The exciting fight card titled “HANGAD NA PAGHIHIGANTI” will be telecast by the giant broadcast network ABS-CBN beginning at 10:45 p.m. over the pre-eminent Channel 2. In the two other highly anticipated fights on the undercard Jason Pagara (21W-1 L, 10 KO’s) and Romeo Jakosalem (10W-3L-1D, 5 KO’s) made the required weight for their 10 round lightweight bout while super featherweights James Bacon (11W-1L, 7 KO’s) and Cerilo Espino (7W-4L, 6 KO’s) tipped the scales at 129 lbs for their 8 round bout. The fights which will be staged at the plush Pacific Ballroom of the Waterfront Hotel and Casino will begin at 6:00 p.m.